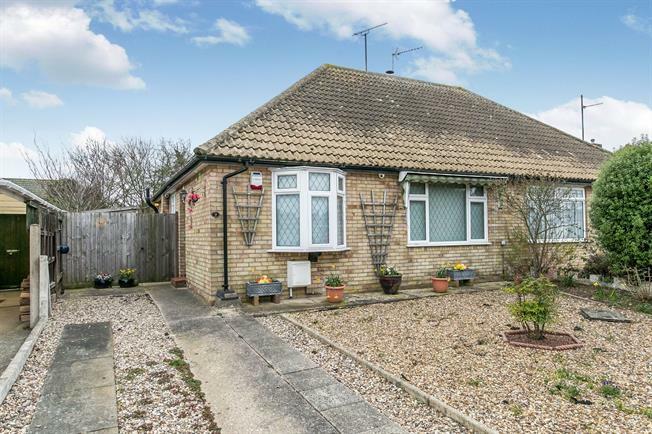 2 Bedroom Semi Detached Bungalow For Sale in Frinton-on-Sea for Offers Over £220,000. Bairstow Eves are pleased to present this two bedroom semi detached bungalow, offered with no onward chain and featuring off road parking and an enclosed rear garden. The property also features a large living room, fitted kitchen and bathroom, and a conservatory. Located close to Frinton on Sea town centre and all local amenities and shops, including mainline to London rail service, please call now to arrange your viewing. Two radiators, gas fire with mantle over, double doors leading to conservatory. Double glazed window to rear and side, L-shape configuration, range of matching eye level, cupboards and drawers, eye level electric oven, electric four ring hob with extractor hood over, space and plumbing for appliances including fridge, freezer washing machine/dryer and dishwasher, one bowl sink with drainer built into worktop, gas boiler, door leading to rear garden. Brick built, double glazing, power sockets. White suite comprising panelled bath with electric shower over, low level w/c, wash hand basin, fitted storage cupboard, mirrored eye level storage, obscured double glazed window to side, tiled walls, heated towel rail. Raised mostly laid to lawn, with shingle area and block paving. Outside power and tap.